Christina's previous experience included training in both anthropology and computational biology; she uses genomic-scale data to study interactions among gene flow, admixture, natural selection, and behavioral ecology in human and non-human primate populations. She is currently leading several of our lab's NIH-funded rainforest hunter-gatherer functional and evolutionary genomics projects. Stephanie recently completed her PhD in Anthropology at McMaster University, where her dissertation research integrated ancient DNA and historical data to study human pathogens and health in antiquity. She is currently directing the ancient DNA laboratory at Penn State and developing archaeogenomic projects focused on reconstructing human population and disease histories. Katie is interested in the interactions among genetic and epigenetic variation, individual fitness, and the environment. She joins our lab from Duke University where she earned her PhD and Emory University where she was an NIH FIRST Postdoctoral Fellow. She previously worked with aphids, ring-tailed lemurs, and white-throated sparrows. In our lab, she is studying human functional genomic and epigenomic variation and evolution! Richard is interested in lemur evolutionary ecology and the ethics of conservation. Specific areas of focus include dietary and behavioral niche specialization, with an eye towards how these variables can factor into the implementation of conservation efforts that minimize human-lemur resource conflicts. 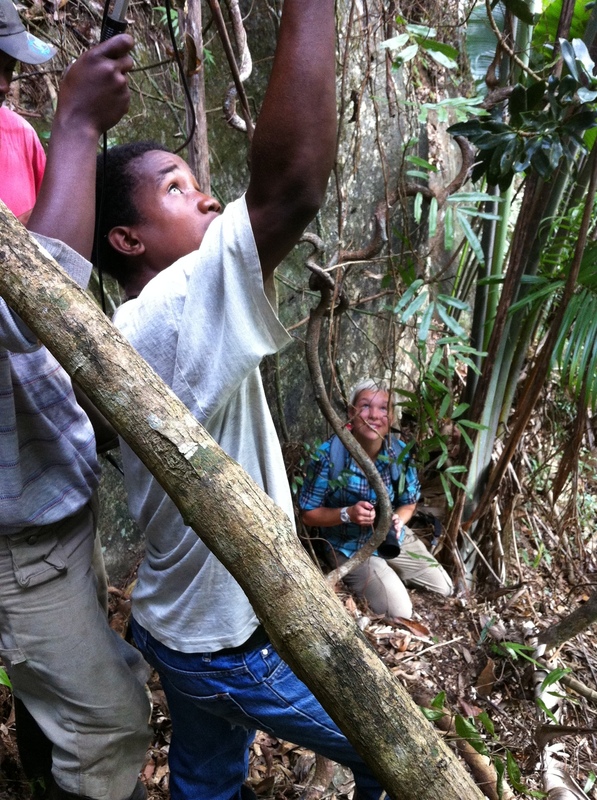 He is currently conducting ethnographic and ecological fieldwork in Madagascar for his dissertation research. Alexis is a Biology graduate student with strong interests in evolution. Her dissertation research is focused on how human behavior impacts non-human evolutionary biology, including the morphological and evolutionary genomic characterization of size changes in response to human hunting pressures. The introduction chapter of her dissertation chapter has been published as a review article, which you can read to learn more! Alexis also maintains a research blog as part of her website. David joins the lab through the Penn State’s interdisciplinary Ecology program. He has major interests in evolutionary ecology, ecological genomics, and conservation biology. He is currently exploring ideas for bioinformatics research on aye-aye sensory ecology and evolution - including comparative genomics analyses with the striped possum (Dactylopsila trivirgata), a marsupial species sharing many morphological and behavioral convergences with aye-ayes! Maggie is a Ph.D. student in the Anthropology program. 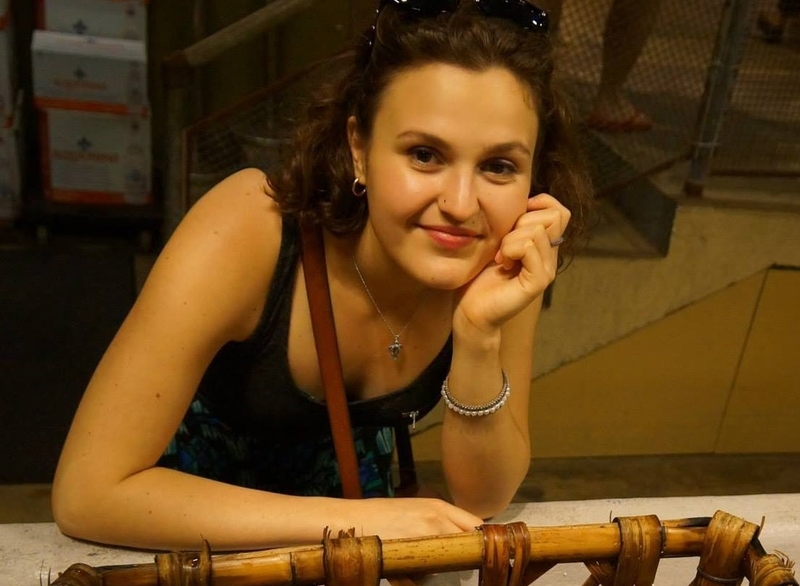 She is broadly interested in primate conservation genomics, and plans to pursue a dissertation project that will integrate primate genomics, biology, and ecology. Maggie is also passionate about education, teaching, and scientific outreach/engagement; she maintains an Instagram account titled Mystery Magnification. Diego is broadly interested in human evolutionary genomics. For his dissertation research he is developing several functional and evolutionary genomics projects with human parasites, from which to make proxy insights about key time periods and cultural innovations in human evolution. His current major experimental project is with bedbugs! Ebony is broadly interested in the paleoepidemiology of infectious diseases. She also has extensive archaeological field experience. For her master’s thesis (University of Wyoming) she created an agent-based model to simulate the spread of tuberculosis in a hunter-gatherer social context. During her PhD, Ebony would like to integrate genomic, ethnographic, and archaeological data to help advance our understandings of how different social systems affect disease spread and overall human health. Audrey is a sophomore Millennium Scholar interested in human evolutionary genomics. She is developing the computer science and bioinformatics skillsets necessary for this area of research, and will next be leading an independent project! Audrey was also appointed to Penn State's prestigious, three-year Presidential Leadership Academy. 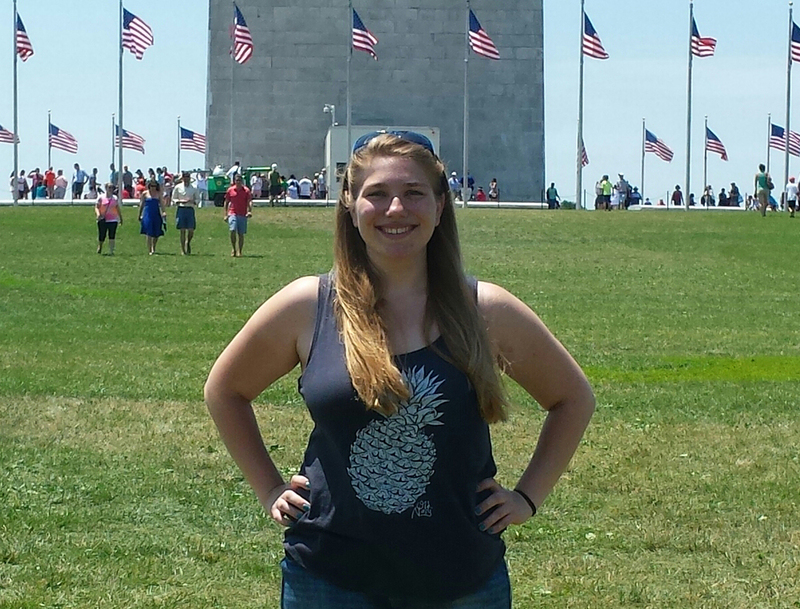 Mariah is a sophomore Paterno Fellow interested in human evolutionary genomics and anthropological science. She is currently doing experimental research with our parasites as proxies for human evolution, and she is developing an independent honors thesis project on the evolution of human ectoparasite sensory systems. Kathryn is an evolutionary ecologist who uses invasive and introduced plant systems to understand rapid evolution and range expansion in novel environments. She recently completed an NSF Postdoctoral Fellowship at Colorado State University, where she began a research program using herbarium specimens and ancient DNA to study evolution during the course of an invasion. Her work also includes the population genomics of ornamental wildflowers. She joins us after receiving a prestigious Eberly Fellowship to support mentored independent research; her co-mentor is Jesse Lasky. Raining’s primary advisor is George Milner. Raining is interested in paleoepidemiology of infectious disease. Using human skeletal remains from archaeological sites, she intends to incorporate ancient DNA methods to better understand transmission patterns of ancient infectious diseases with the interaction between prehistoric migration, settlement pattern, and environmental changes. Rich is an archaeologist who joins us from Doug Kennet’s Human Paleoecology & Isotope Geochemistry Laboratory (Doug is his primary advisor). Rich is interested in prehistoric population genetics and human behavioral ecology. Specifically, he studies how population dynamics change in response to social and environmental events. Currently he is combining isotopic and ancient DNA analyses to study household dynamics and life history patterns in Mesoamerica. Tina is interested in the evolution of human phenotypic and genetic variation. Her doctoral research focuses on the evolution of modern human hair variation, using quantitative, functional (physiological), and evolutionary genetic methods to study and appreciate the origins of our phenotypic diversity without using racialized terminology. She is advised by Nina Jablonski and co-advised by Mark Shriver. Our lab is supervising Heritiana’s PhD research -- he is collecting paleogenomic and morphological data to test existing species definitions (and potentially identify cryptic species) within the extinct subfossil lemur genus Archaeolemur. Heritiana’s co-advisors for this project are Laurie Godfrey (University of Massachusetts) and Jeannot Randrianasy (University of Antananarivo). He was recently at Penn State for one year for ancient DNA labwork and dissertation research. Our lab is also supervising Rindra’s Malagasy human population genetics PhD project, with University of Antananarivo co-advisors Spiral Germain Jules, Ravelonjanahary Soanorolalao, and Jean Freddy Ranaivoarisoa. Rindra recently collected 200 DNA samples from across the island of Madagascar and recently visited our lab at Penn State for bioinformatics training and population genomic data analysis. Monica is interested in the evolution of the human microbiome and the role it plays in human health and disease. In our lab, she worked with multiple collaborators including Emily Davenport on a project to study whether chimpanzees acquire functional microbiome components from the termites they consume. Monica is now working for the microbiome biotech company uBiome in San Francisco! Angela's interests include medicine, bioinformatics, and evolutionary biology. While part of our lab, she completed an honors thesis project on a biogeographic (population genetic) analysis of diverse human parasite species to test hypotheses of parasite transfer from archaic hominin to modern human populations. Abby's interests included the development and application of computational biology methods for studies with immunology and infectious disease components. While a member of our group, Abby worked on bioinformatic analyses of tapeworm genome sequence data and helped conduct functional genomics experiments on the human tapeworm cyst heat response in Peru! For her honors thesis, Maya led an ancient DNA study of the “Nittany Lion” genome. Mountain lions are now extinct in PA, but Maya is used our clean lab to extract DNA and analyze mitogenomic diversity from the skeletons and skins of 1800s mountain lions from this region. Here is a great PSU news story about Maya and her research. Jacob's honors thesis research focused on human tropical rainforest hunter-gatherers, using population genomics data to test hypotheses of potential metabolic or thermoregulatory adaptations in these groups related to the common ecological challenges of their habitats (e.g., food limitation, high heat and humidity). Stephen's interests include human evolutionary medicine, health, and disease. While in the lab he studied tapeworm biology and functional genomics as a proxy for the evolution of hominin meat eating and food cooking behaviors. He is currently pursuing a health professional career. While a member of our group, Adrijana led a bioinformatics study to test hypotheses of adaptive evolution related to human dietary history, facial shape changes, and dental variation. She has major interests in human genetics and public health and is currently pursuing a career in genetic counseling. While a postdoc in our laboratory, Logan focused on paleogenomic projects including mitochondrial and nuclear genome analyses of Madagascar’s extinct subfossil lemurs. He also studied the ecological history of wild New World plants related to pumpkins and squashes, including how these populations may have been affected by the extinctions of megafaunal mammals, their natural seed dispersers. For her honors thesis, Kate compared aye-aye food resource availability vs. foraging behavior (with a field-based study in Madagascar) to help understand why the home ranges for individuals of this endangered species are so huge. Here is a nice PSU article about Kate and her thesis research. 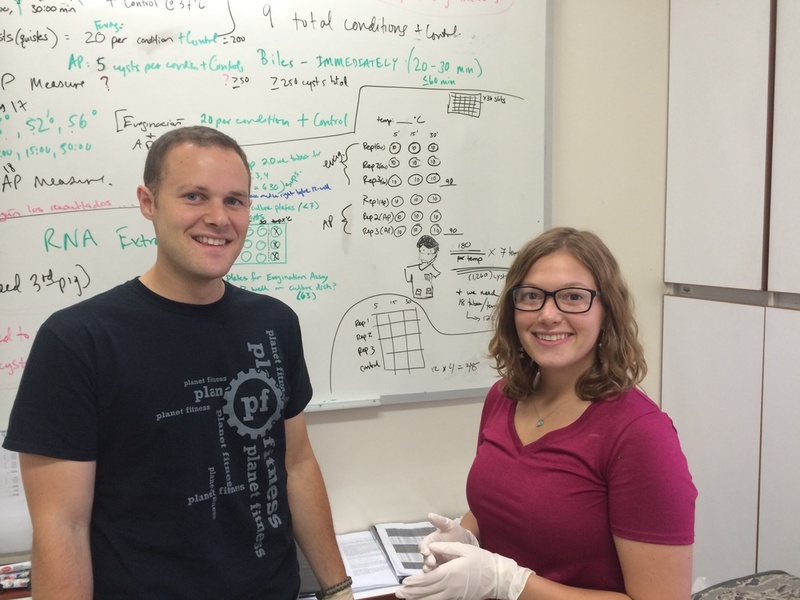 Kate also received the NSF Graduate Research Fellowship to support her graduate studies. Jason studied human evolution and population history, especially the fate of evolutionarily advantageous alleles in admixed populations, including among the Malagasy, the people of Madagascar. 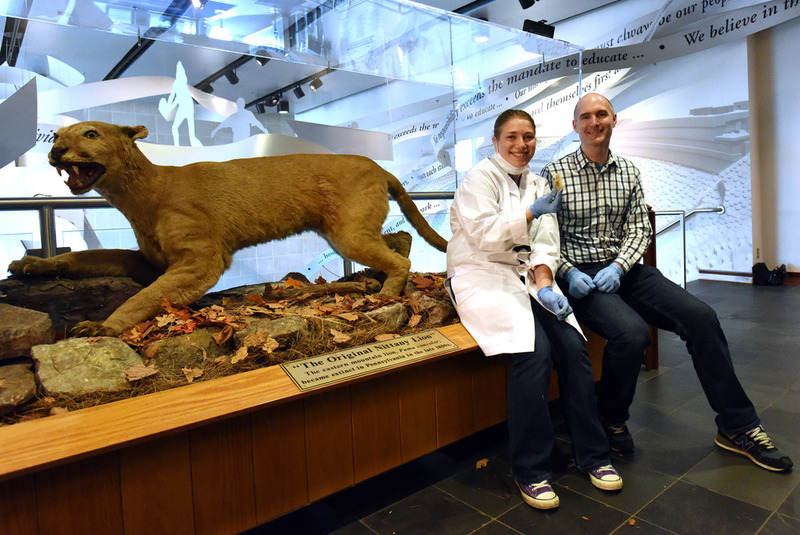 Undergraduate student Maya Evanitsky collects a sample from "The Original Nittany Lion" at the Penn State All Sports Museum for her ancient DNA study. Photograph: Pat Little, PSU. Graduate student Stephen Johnson and undergraduate Abby Koenig, here in Peru planning out their tapeworm functional genomics experiments. Dr. Perry and graduate student Rindra Rakotoarivony near the Anja rock shelter in northern Madagascar, the archaeological site with the earliest reported evidence of humans on the island. Perry lab members with three students from Peru (Eduardo Gushiken Ibanez, Ana Paula Vargas Ruiz, and Alejandro Ortigas Vasquez) and Summer Research Opportunities Program student NaTazah O'Neill who was visiting us from Howard University, during a summer 2017 two-week bioinformatics and RNA-seq workshop (funded by a Wenner-Gren Foundation International Collaborative grant) led by lab postdoc Christina Bergey. Graduate student Alexis Sullivan using the Artec Space Spider to collect high-resolution 3D scans of a Verreaux's sifaka bone at Beza Mahafaly Special Reserve, Madagascar. Undergraduate student Monica Guardado presenting her poster at the 2017 AAPA meeting in New Orleans. Undergraduate student Maya Evanitsky with Dr. Perry after Maya sampled "The Original Nittany Lion" at the Penn State All Sports Museum for her ancient DNA study. Photograph: Pat Little, PSU. 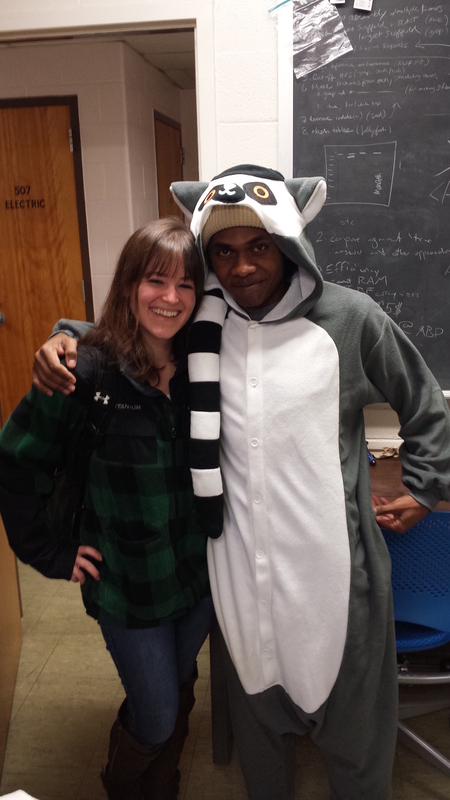 Graduate students Alexis Sullivan and Heritiana Randrianatoandro (as a ring-tailed lemur!) in their office. The inspiring group of participants from our inaugural Genetics and Bioinformatics Workshop in Antananarivo, Madagascar, June 2017. Instructors (all members of our lab) were Heritiana Randrianatoandro (far left) Rindra Rakotoarivony (far right), and Richard Bankoff and Dr. Perry (both in the very back row). PhD student Rindra Rakotoarivony being interviewed by Madagascar national newspaper and television reporters about his dissertation research and about our inaugural Madagascar Bioinformatics Workshop!